Medicare Members Identify Other Perceived "Gaps in Plan Communication"
DALLAS, June 10, 2018 /PRNewswire/ -- A report from a survey of 500 Medicare plan consumers was released today that provides insight into member attitudes toward health plan communication. Fielded during 2017, The HealthMine Medicare Report analyzes enrolled Medicare Advantage members, 70% of whom have one or more chronic conditions. 70% of Medicare Advantage members reported they have at least one chronic condition. Chart totals exceed 100% as some respondents have more than one chronic condition. Medicare Advantage members say they want more communication about health from their plan. The chart shows the percent who believe they get guidance compared to those that want the help from the plan. Connecting at-risk members with the right information quickly is critical to plan success and member satisfaction. "Gaps in communication" often signal the beginning of gaps in care. 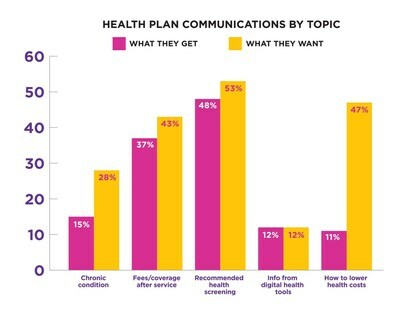 The most striking perceived disconnects identified via the survey were related to health care cost reduction information, health plan follow-up and digital health tool integration. Just sixteen percent (16%) of Medicare plan members surveyed said they had a follow-up on quality of care after a provider visit. Eleven percent (11%) of Medicare plan members believe they are informed about how to lower health care costs, versus forty-seven percent (47%) who desire the information. 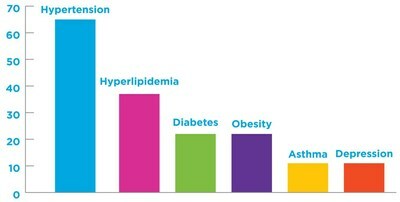 *Totals more than 100% as some respondents have more than one chronic condition. Only ten percent (10%) of plan members surveyed said their health plan offers guidance about these chronic conditions. Data showed that seventy-seven percent (77%) of Medicare Advantage plan members use digital health tools, including blood pressure monitors, fitness trackers, medication/pill trackers and more. However, only nine percent (9%) said their plan integrates data from health tools. "Our experience working with Medicare Advantage plans has shown that health plans are making real strides to connect data to members with meaningful, timely, clinical help and reminders. The challenge is always reaching members and knowing each member's communication preferences. We have more than 10,000 baby boomers aging into Medicare daily, and as that generation becomes the majority of Medicare Advantage members we expect improved communication with scalable digital technology. Medicare Advantage plans are quickly leveraging technology to zero in on each member's clinical needs and communication preferences," said Bryce Williams, president and CEO of HealthMine. The HealthMine Medicare Report queried 500 insured age 65+ consumers who are enrolled in a Medicare program. The survey was fielded by Survey Sampling International (SSI) in 2017, and released as a full report in June 2018. Data were collected via an opt-in panel. The margin of error is 4%. Survey Sampling International (SSI) has been the worldwide leader in survey sampling and data collection solutions, across every mode, for 40 years.